New York City, 1968. The RAND Corporation had presented an alluring proposal to a city on the brink of economic collapse: Using RAND's computer models, which had been successfully implemented in high-level military operations, the city could save millions of dollars by establishing more efficient public services. The RAND boys were the best and brightest, and bore all the sheen of modern American success. New York City, on the other hand, seemed old-fashioned, insular, and corrupt-and the new mayor was eager for outside help, especially something as innovative and infallible as "computer modeling." A deal was struck: RAND would begin its first major civilian effort with the FDNY. Over the next decade-a time New York City firefighters would refer to as "The War Years"-a series of fires swept through the South Bronx, the Lower East Side, Harlem, and Brooklyn, gutting whole neighborhoods, killing more than two thousand people and displacing hundreds of thousands. Conventional wisdom would blame arson, but these fires were the result of something altogether different: the intentional withdrawal of fire protection from the city's poorest neighborhoods-all based on RAND's computer modeling systems. Despite the disastrous consequences, New York City in the 1970s set the template for how a modern city functions-both literally, as RAND sold its computer models to cities across the country, and systematically, as a new wave of technocratic decision-making took hold, which persists to this day. In The Fires, Joe Flood provides an X-ray of these inner workings, using the dramatic story of a pair of mayors, an ambitious fire commissioner, and an even more ambitious think tank to illuminate the patterns and formulas that are now inextricably woven into the very fabric of contemporary urban life. The Fires is a must read for anyone curious about how a modern city works. Joe Flood is a journalist who has spent the last seven years--since before he graduated from Harvard--researching the facts and implications of the epidemic of fires that swept through New York City in the 1970s. He has worked for "DoubleTake Magazine," and "The New York Sun," and is the co-editor of the "definitive" anthology "Resistance: A Political History of the Lower East Side." "Flood casts a wide net, looking into New York machine politics, the development of systems analysis, the dynamics of urban growth and an array of unexpected byways... a riveting look inside one of the most challenging eras of recent NYC history. Important reading for anyone who cares about cities and how they are governed." "[Flood's] compelling research resonates in another era of budget-cutting and data-driven decision-making." ""Flood's book, an account of the fire epidemic that ravaged the city in the 1970s, traces the history of well-intended government intervention that, the author claims, inadvertently fanned the flames of an era that FDNY veterans still call "The War Years." The period has a certain eerie connection to the present day: a technocratic mayor closing firehouses amid massive budget cuts while the local economy stagnates. ... The story warns against the risks inherent in even the best-intended reformist plans." "It's comforting to believe that science, technology, and intellectual rigor can solve the world's ills. 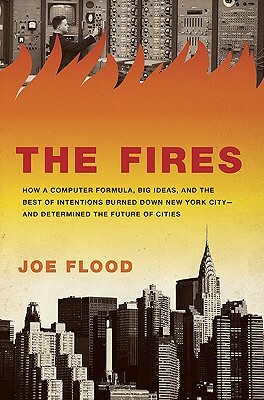 In The Fires, Joe Flood pierces that progressive certainty by exhaustively researching a long-forgotten period of New York's history-when algorithms helped the city's smartest leaders let the city burn. Flood's book reads like the best fiction, but is all the more important for its depiction of a real-life metropolitan tragedy." "The Fires is a gripping story of human tragedy and intellectual hubris that casts important new light on one of the most extraordinary episodes in the history of urban living. A cross between The Power Broker and The Wire, The Fires gives us crucial answers to a big question: how do cities fail?" "I arrived in the South Bronx as a young firefighter in 1970. The enormity of the devastation was overwhelming. The fact that the city kept burning, despite the dedication of my fellow firefighters, seemed to defy logical explanation. Joe Flood has done an outstanding job making sense out of the chaos, showing the forces that were permanently reshaping New York-starting with the Fire Department-as it headed for the triumphs and tragedies of the 21st century." "In a novel, fascinating manner, Joe Flood uses the NYC Fire Department as the anvil on which to hammer out the events between 1965 and 1977 that led to the city's collapse and changed the way we run big cities. Although already familiar with what occurred-not only did I live through it, but I inherited it when I became Mayor-I was enthralled by Flood's spectacular and insightful account." "In a story that reads like an epic novel, Joe Flood illustrates for us just how our greatest city declined and completely fell apart forty years ago, at the hands of a managing elite who believed they could plan, organize, and control a city by studying computer trends and implementing lofty plans. Our leaders, from Barack Obama to Michael Bloomberg, have much to gain from reading The Fires, and the rest of us have much to lose if we do not read this enlightening and erudite book, for we are on the brink of letting this history repeat itself."